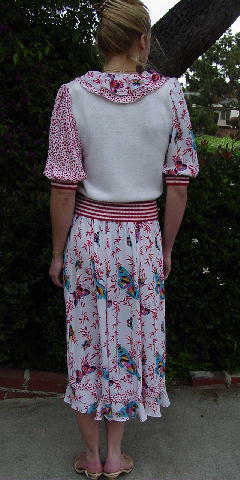 The body of this vintage Diane Freis outfit is 55% acrylic and 45% woven cotton. The sleeves, skirt, and trims are 100% polyester. The blouse has a white background with half sleeves with 2" wide red and white horizontal ribbed cuffs and there are shoulder pads. The left sleeve has freeform red dots and the right sleeve has red bamboo and leaves and butterflies in turquoise blue, black, dark pink, yellow, white, red, and orange, with Diane Freis written on the front and back lower sections of the sleeve. It has a wide 7" long V neckline with a double set of ruffles. Diane Freis is written in two places on the back upper ruffle. There are two long ties with long white tassels and a red and white bead on each. The full flirty skirt has a 2" wide elastic waistband with a 1" wide accent horizontal band and a lower 2 3/4" wide ruffled bottom. 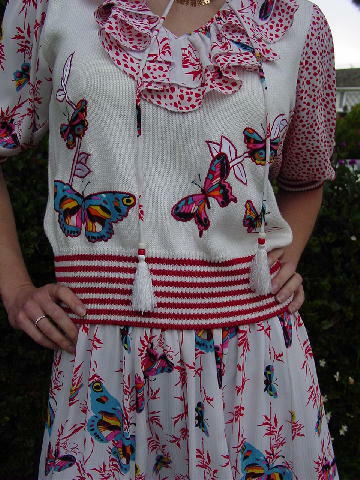 The white background skirt has the bamboo and butterfly pattern that the blouse sleeve has, and Diane Freis is written all over the skirt front and back. The pieces can be worn together or separately. It's from a South American model, who sold it because she needed the money.